Don't have a Twitter Account? No Problem. Follow us via text message. Just send a text to # 40404 and write follow rivercitytigers in the message. River City Wrestling is designed to promote the sport of wrestling. Wrestling is the world's oldest and greatest sport. The discipline, balance and skills that are taught through the sport of wrestling will strengthen your body, mind and soul. Our goal is to provide our athletes with a safe, healthy and enjoyable environment in which to compete; without fear of abuse, either physical or verbal from anyone whether it be opponent, official, coach or spectator. The River City Wrestling Club Freestyle Program was established in 1995 by Jim Kraeszig to promote the sport of wrestling in the Louisville Metropolitan area. The Freestyle Club (now known as the Spring Program) is open to any athlete, K - 12th grade who wishes to start or improve their skills in the sport of wrestling. The River City Wrestling Club has grown to be one of the largest wrestling clubs in the state of Kentucky. 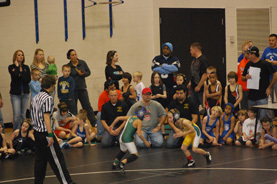 In 2005 River City Wrestling expanded to offer a Folkstyle wrestling club to wrestlers from 2nd through 8th grades. In the first season of Folkstyle wrestling, River City had more than 30 wrestlers representing 14 area schools. The Folkstyle club has maintained an enrollment of 60+ wrestlers each year since its inception and has finished as high as 3rd at the Middle School State Championships, 2nd at the Middle School State Duals, 1st at the Middle School and Youth Regional Championships and 5th at the Youth State Championships. The program is proud to have multiple State Placers and State Champions at both the Middle School and Youth level. To bring Glory to God through the sport of wrestling. To encourage the overall discipline of all participants. To practice the ideals of sportsmanship and citizenship. To improve the leadership of all wrestlers. To maintain a consistent, disciplined work ethic in practice. To improve the skill level of all wrestlers. To promote the sport of wrestling and promote a life-long love of the sport. Every wrestler should expect to work hard and commit themselves to being the best, not only on the wrestling mat but in the classroom and the community. River City Wrestlers are expected to maintain high standards in sportsmanship, citizenship and respect for persons and property. They are expected to have good manners, a positive attitude and an excellent work ethic. River City Wrestlers are expected to go to class daily, pay attention, work hard, and respect their teachers. They should set good examples for the rest of the student body when it comes to manners, respect for persons and property and all school rules and regulations.